Time and time again we hear, “When do you recommend we start our remodel?”. Well the answer is…anytime! However, some times are better than others depending on the project. 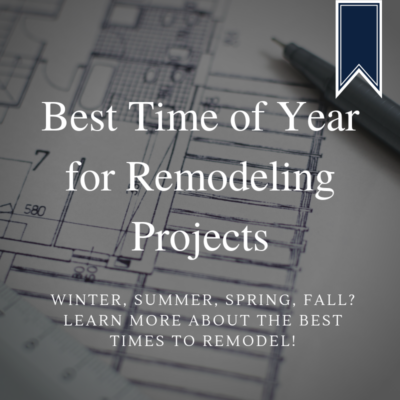 Here are the “ideal” times for remodel projects throughout the year! When you think of remodeling in January, you usually think of working outside in the cold, but this is actually a good time to start an addition. Frozen ground and dry air are better for digging foundations and pouring concrete footers than muddy ground and humidity. Additionally, the winter months tend to be less busy for builders! Spring is traditionally home building season, not only because consumers are finding the money to do projects, but also because it’s the time we start to come outside more and want something new. Projects like patios and outdoor rooms are great to plan for this time frame! Indoor work like kitchen or bathroom remodels are recommended during the summer months. The last thing you want to do in the sweltering heat is an attic bedroom! If you vacation in summer, it’s great to plan your remodeling effort for when you’ll be away. You can avoid all the unpleasant inconveniences of living with a remodel and come back to a brand new addition! While the first part of this quarter is ideal for outdoor work and new construction starts, it is traditionally the time when homeowners want their remodeling finished. The impending holidays are around the corner, and there’s a scramble to get things done by end of November. So, if you’re willing to have crews in your home during the holiday season, this is a good time to schedule anything from an addition to a kitchen remodel!